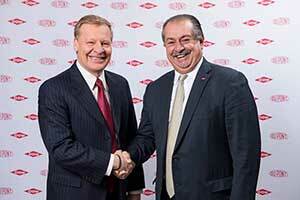 Edward Breen (left), chairman and CEO of DuPont, and Andrew Liveris, president chairman and CEO of Dow, agreed to merge in December. Stockholders at both DuPont and Dow Chemical have voted to approve all stockholder proposals necessary to complete the merger of equals transaction–a key milestone in the process to merge the two companies and subsequently pursue the intended spins of three independent companies. The companies expect the merger transaction to close in the second half of 2016, subject to customary closing conditions, including receipt of regulatory approvals. DuPont and Dow intend that, following the completion of the merger, the combined company will pursue the separation of the combined company’s agriculture business, material science business and specialty products business into three independent, publicly traded companies, subject to approval by the DowDuPont board and receipt of any required regulatory approvals. The intended subsequent separation into three independent, publicly traded companies is expected to be consummated as soon as practicable following the merger closing, but finalization of the separations is not expected to exceed 18-24 months after the merger closing. The final voting results on all agenda items for each company’s special meeting will be filed with the SEC in separate Form 8-Ks and will also be available at on both Dow and DuPont websites, after certification by each company’s inspector of elections. 1 Comment on "Dow, DuPont stockholders approve merger"